I love making headbands. 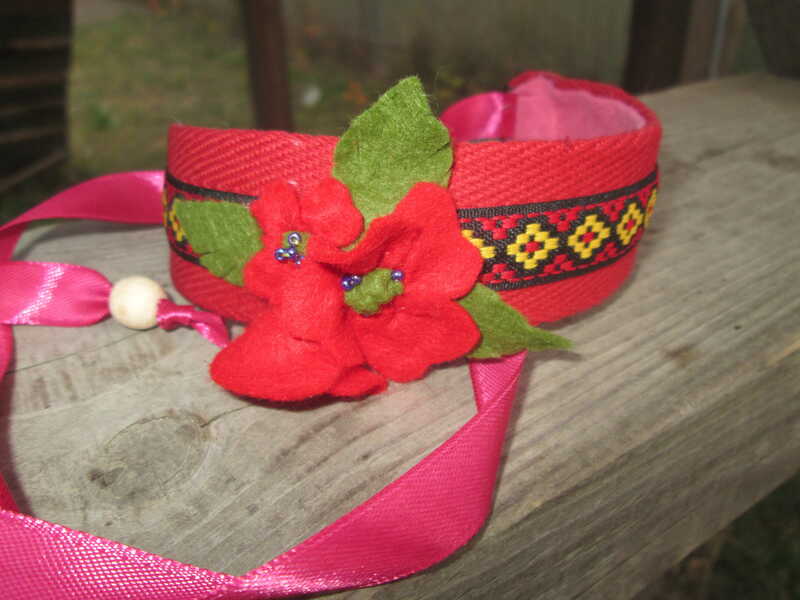 This one is made in ethnic style or Ukraine style with red poppy flowers. This headband is made out of Ukraine ethnic trim you can get in my Etsy store. The base for it is made after recycled crafts, cause I used a piece of plastic bottle as a foundation for the headband. I cut out a piece of plastic and used hot glue gun to attach trim to it. First I applied wider piece of the trim and them added a narrower one on the top from the front side. Next, I placed to wooden bids on 2 pieces of ribbon and tied knots on one end of the ribbon. The other end was attached to the headband using glue gun. These are the headband strips used to hold in on one’s head. I have used a piece of felt to cover up the other side of the headband and hide the plastic. I glued it there with the hot glue gun. Finally, I have made a small red poppy flower bouquet out of felt. Each flower consists out of 4 heart shape petals glued together. I attached them to the headband with the glue. You can find more photos of this DIY here. You can follow my fabric flower Pinterest board to get more inspiration. This entry was posted in Handmade jewelry and tagged DIY, DIY headband, ethnic headband, fabric flowers, felted flowers, handmade, poppy flowers, upcycling. Bookmark the permalink.